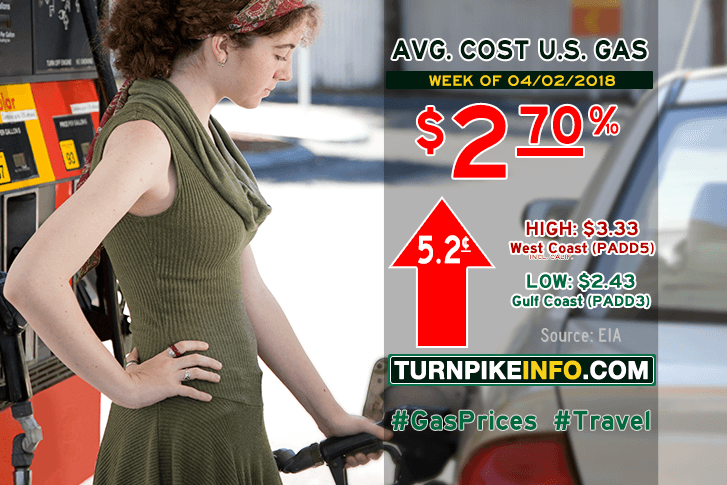 Fort Lauderdale, FL – Gas prices increased over five cents during the past week, according to the latest gas price report from the U.S. Energy Information Administration. The weekly E.I.A. price survey shows the average cost of a gallon of regular unleaded is now $2.70. No region was spared the nickel price increase this week, in practical terms, at least. The highest price increases were seen across the Rocky Mountains and the Lower Atlantic states, where prices went up by seven cents and six cents, respectively. All other regions were hit with the nickel price increase, although, technically, the Gulf and Central Atlantic states’ price increases were shy of a full five cents, according to the weekly report, which measures prices to the tenth of a penny. The news was only slightly better for truckers, which is to say, nearly as bad. Prices jumped over three cents per gallon, on average, for diesel, to hit over $3.04, according to the E.I.A. Fuel prices for all regions are shown below, as gathered from www.eia.gov.